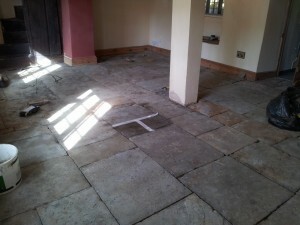 We visited the property back in April to quote for this Flagstone floor restoration in Banbury, Oxford. The client had just bought the house and wanted to restore the flagstones due to it being a listed building and the floor being hundreds of years old. 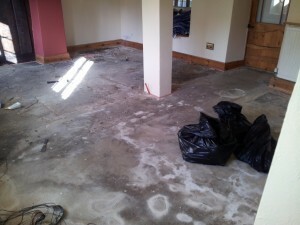 The floor was covered in screed and bitumen which we could not help to remove but we advised the client of what to do and asked him to call us back once the floor had been revealed. The client took our advice and chipped up all of the screed and had the flagstones sandblasted. This left the floor as you see here and the client called us back in to quote him for our Flagstone floor cleaning services Oxford and do a demo for him. The floor did not have a damp proof membrane and the client was advised by a surveyor that the stone should be allowed to breathe and any moisture allowed to evaporate. This is why we had to use a colour enhancing impregnator on this one over a sealer. A sealer would have looked even better, but the client was happy with the demo patch. 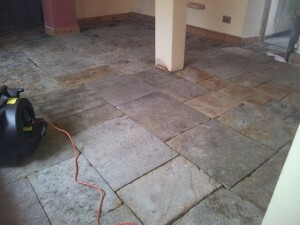 We quoted for an initial deep clean and impregnate of flagstone floors in Banbury, Oxford before grouting as the lime putty that the client was using could have stained the stone if it was not impregnated, and then a further light clean and coat of impregnator after grouting. This is how the floor looked after the initial deep cleaning of flagstone floors. We had to leave the floor to completely dry before impregnating with 3x coats of a colour enhancing impregnator. This was sped up with our air movers which we left in the property. It cleaned up really well and the natural colours in the stone were really enhanced as you can see. The floor was then grouted with a lime putty which was a big job for the client due to the depth of the flagstones – he required 1 tonne of grout! We then returned to do a light clean of the floor and give it another coat of impregnator, and here is the finished result! An amazing transformation I think you will agree, however, we can not take all the credit for this one as the client did so much of the flagstone floor restoration himself. He was very pleased with the work that we did for him and relieved that it was all finished after nearly 6 months of working on it! 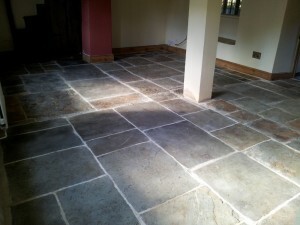 If you are looking for Flagstone floor cleaning companies in Oxford, contact us now for excellent results!